1. Eucarp – They are true fruits formed from superior ovary , having functional seeds but no additional floral parts fused with them. Example - grape, mango. 2. Pseudocarps - This type of fruit generally formed from inferior ovary, having functional seeds and additional floral parts are fused with pericarp. Example- Apple. 3. Parthenocarps - The fruits are formed without fertilization, as a result seedless fruits are produced. Example Banana. A. Alchemical fruits – they are simple, dry, single seeded and indehiscent. TTey are of different types - typical achene (Mirabilis, Clematis), Caryopsis (wheat, rice, maize), cypsela (Dandelions), nut (cashewnut),Samara (elm, Indian elm). B. Capsular fruits – They are simple, dry, many seeded and dehiscent. They are five types – legume (peanut, groundnut), follicle (Larkspur), siliqua (mustard), capsule (cotton, Lady’s finger, datura). C. Schizocarpic fruits - Simple dry, many seeded that breaks up into many seeded part. They are of different types- cremocarp (fennel, cumin), carcerulus (Salvia, Ocimum), compound Samara (Acer, Dodonaea), regma (castor, euphorbia), Lomentum (radish, tamarind, acasia). D. Simple succulent fruits – Simple fruits which have associated fleshy structure made up of pericarp and associated structure. They are – berries (banana,grape, guava), drupes (plum,peach, cherry), pome (apple, pear). Etaerio of Achenes – Individuals fruitlets are Achenes. In Clematis the individual Achenes possesses persistent hairy styles. In aggregate fruit of Rose called hip. Etaerio of Berries - Individual berries are separate while in custard apple they are fused over an elongated thalamus. Etaerio of Follicles – Calotropis, Michelia. Etaerio of samaras - Ailanthus. 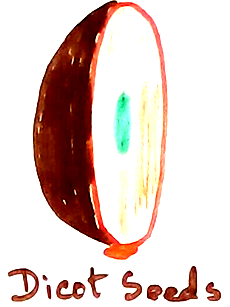 Etaerio of Drupes - individual fruitlets are called druplets. Example- blackberry, raspberry. Composite fruit - They are also called multiple fruits. The fruits develop from the entire inflorescence. 1. Sorosis – The composite fruit- develops from either a spike or female catkin. Example- female catkin in Mulberry, pineapple develop from intercalary sterile spike with persistent bracts and peduncle. 2. Seconds and syconium- It develops from hypanthodiumwith flask shaped receptacle becoming fleshy and individual female flowers producing small achene – like fruitlets. Example - peepal, fig, Banyan. 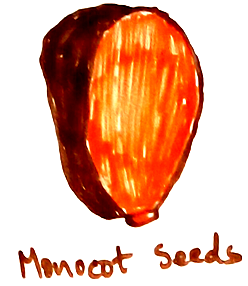 Seeds – seeds are the embryonic plant which is covered by the seed coat and give rise to the new plant. It is produce due to conversion of ovary during plant reproduction. Monocots – Number of cotyledon is one. It cannot be divided into two equal halves. Example - Maize, rice, wheat, sugarcane, banana etc. 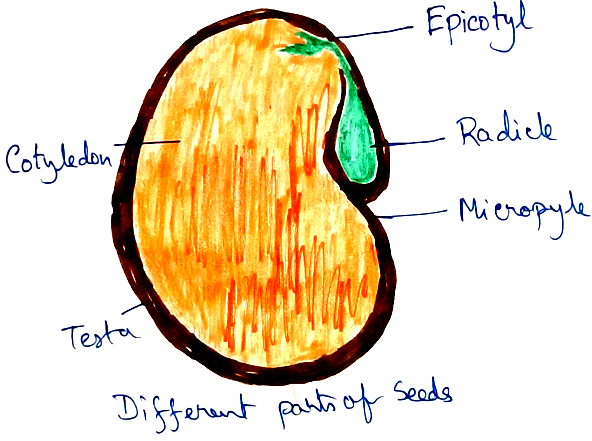 Dicots - Number of cotyledon is two. We can divide the seed into two equal halves. Example - Mango, pea, gram, pulses etc.